The influence of local actors and socioeconomic constraints on biological invasions is often ignored. Wetland plant harvesters appeared to intentionally influence cattail (Typha domingensis) invasion around Lake Pátzcuaro, México, by altering their harvesting regimes, according to interviews with 44 expert respondents and botanical surveys. The oldest and most experienced harvesters reported controlling Typha initially, sometimes through organized eradication efforts, in order to protect Schoenoplectus californicus, an economically and culturally valuable wetland plant. Later, outsiders commoditized Typha by introducing new weaving designs popular with tourists, while industrial products and new livelihood activities reduced Schoenoplectus harvest. Harvesters from several communities began to promote Typha re-growth. Some harvesters, however, continued to combat Typha to maintain Schoenoplectus production, especially where supply was limited. Interviews suggested novel ecological cause–effect mechanisms and restoration strategies; some local harvesting regimes could efficiently conserve rare plants. An understanding of local ecological knowledge and incentives can inform invasive species control and conservation policy at a broader scale. Ecologists recognize that human activity can promote biological invasions (Mack et al. 2000), but the social factors that influence invasions and their management remain less understood. Severe impacts on commodity production and ecosystem services provide a justification for controlling invasive species (Perrings et al. 2002; Pimentel et al. 2005). Yet, invasions can disproportionately affect different socioeconomic groups within societies, causing harm to some while benefiting others (De Wit et al. 2001; Robbins 2001; Foster and Sandberg 2004; Kirkham 2004; Robbins 2004; Shackleton et al. 2007), so that depending on their perceived interests, some landowners might voluntarily control an invader while others might actively or passively promote the same species. Observed abundance patterns of invasive species could then depend on incentives experienced by local land managers in addition to the mechanistic and stochastic factors that otherwise drive the spread of an invader. Farmers in the midwestern United States, for example, often promote reed canary grass (Phalaris arundinacea) as a forage crop, while other natural resource managers seek to eradicate this plant because of its detrimental effects on plant diversity (Galatowitsch et al. 1999). Despite the potential influence of socioeconomic factors on the management of biological invasions, few case-specific accounts exist (Head and Muir 2004; Schneider 2004). 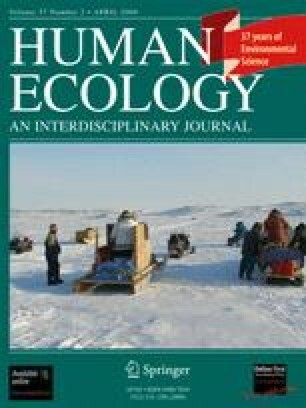 Differing patterns of resource use and perceptions of ecological change within human communities could lead to different management strategies and invasion outcomes, with cascading effects on ecological communities and ecosystems. At a broader scale, understanding why and how local people manage invasions is critical for informing invasive species policy. Cattails (Typha spp.) are potentially invasive yet economically useful plants that could inspire widely different management responses. Under high nutrient loads and altered hydroperiods, Typha spp. often form dense monotypes that reduce plant, avian, and insect diversity (Apfelbaum 1985; Galatowitsch et al. 1999; Linz et al. 1999; Boers et al. 2007). At the same time, people worldwide use Typha for weaving, food, and fodder, and some groups have even intentionally dispersed and propagated Typha (Morton 1975; Fowler 2000; Turner and Peacock 2005). I suggest that the response of human communities to an increase of Typha abundance ought to depend in part on how people perceive Typha versus alternative resources. If Typha threatens valuable resources, local communities might respond by actively controlling an invasion, while if Typha itself becomes a valuable resource, people might encourage its spread. I hypothesize that intentional management based on heterogeneous local values substantially affected Typha invasion and subsequent composition of the wetland plant community. This case study focuses on wetlands surrounding Lake Pátzcuaro, Michoacán, México, where Typha domingensis (hereafter “Typha,” but locally known as “chuspata”) currently dominates emergent vegetation (Lot and Novelo 1988), and where “artesanías” (craft products) made from wetland plants provide an important income source (Reyes 1992). The Pátzcuaro basin formed the center of the P’urépecha (Tarascan) empire, where people have woven the bulrush Schoenoplectus californicus (hereafter “Schoenoplectus,” but locally known as “tule”) into utilitarian and ceremonial objects for thousands of years (West 1948). More recently, artisans began using Typha in addition to Scheonoplectus to weave newly-conceived artesanías, such as animal figures, lampshades, and pet houses (Reyes 1992). To understand how Typha invasion might relate to conscious changes in management regimes and broader socioeconomic constraints, I interviewed local people knowledgeable about plant harvesting and conducted visual surveys of vegetation composition. Harvesters can likely provide a reliable source of information about changes in vegetation and management because of their consistent interaction with Pátzcuaro wetlands. Also, rich cultural traditions of natural history and conservation among P’urépecha residents of the Pátzcuaro basin have been well documented (Toledo 1991). Although local ecological knowledge (LEK) gathered through interviews cannot rigorously document cause and effect, LEK can provide crucial and otherwise unobtainable historical context, and can generate novel hypotheses that can be later tested experimentally (Bart 2006). In Lake Pátzcauro, LEK could potentially describe factors that might have contributed to a Typha invasion, and that could inform future conservation management. Two cities, 22 villages (pueblos), and numerous smaller communities (ranchos) surround Lake Pátzcuaro (Fig. 1). Local people often speak P’urépecha as their primary language, although most speak Spanish as well. Lake Pátzcuaro is located on the Mexican central volcanic plateau at an elevation of 2,035 m, measures approximately 100 km2, and is primarily groundwater fed with no riparian inputs or outputs. Wetlands dominated by the emergent macrophytes Typha domingensis and Schoenoplectus californicus currently surround most of the lake (Lot and Novelo 1988), while maize cultivation predominates in adjacent uplands. Botanists consider Typha domingensis native to Mexico (de Rzedowski and Rzedowski 2001), yet its historical distribution at finer geographic scales is unclear. Notably, an earlier botanical survey of the Pátzcuaro basin did not report Typha domingensis (Batalla 1940), nor did West (1948) mention Typha in his detailed cultural geography of Pátzcuaro. In contrast, West extensively discussed traditions of Schoenoplectus use, and noted intensive harvesting during the 1940s. Between May and July 2007 I interviewed in Spanish 33 plant harvesters and 11 other people knowledgeable about plant harvesting practices who lived in or near 13 villages around Lake Pátzcuaro (Fig. 1). I selected villages where harvesting was historically an important economic activity, based on informal communications with local people and a local artesanía study by Reyes (1992). I located harvesters through peer selection and chain referrals (Huntington 2000), in an effort to interview local experts rather than trying to obtain a random sample (Chalmers and Fabricius 2007). In an attempt to access multiple social networks of harvesters, I independently asked five to 20 people in each village to name potential respondents. Semistructured interviews focused on understanding the methods, intentions, and perceptions associated with different management strategies. I asked harvesters to describe in their own words: specific harvesting methods, other activities associated with harvesting, effects of management strategies on vegetation, causes of any changes in management, any changes in wetland vegetation, any other effects of harvesting, and perceptions associated with different wetland plants. To avoid offending respondents I did not ask their age, but instead grouped them into three age groups (<30 years, 30–60 years, >60 years) based on physical appearance or historical information mentioned in the interview. I coded answers by theme and reported the number of responses for each category (e.g., 21 respondents reported that their wetlands burned frequently, whereas six did not), but not all respondents were willing or able to address all topics. I recorded plant species composition in harvested plots and observed respondents as they harvested in the few instances where this was possible. The 33 harvesters and 11 other respondents whom I interviewed expressed strongly divergent management histories, practices, and opinions related to the dynamics of Typha and Schoenolectus, the two primary plants harvested from the Lake Pátzcuaro wetlands. Most respondents (n = 26) appeared to be 60 years or older, while 14 appeared middle aged (30–60) and only four appeared younger than 30. Respondents were predominantly men (n = 33), although 11 were women, five of whom harvested plants themselves. Some of the middle aged or younger harvesters claimed that Typha had always been present in Lake Pátzcuaro wetlands (n = 9), whereas all of the oldest respondents who had harvested consistently throughout their lives reported that Typha had not always been present, and had only initially established within their lifetimes, more than 25 years ago (n = 7). Three respondents from three separate villages reported that Typha had established on the lakeshore from clones that arrived on floating mats of another exotic species, “lirio” or “camalote,” (Eichhornia crassipes). One woman from Tarerio stated that Typha had historically been present only near the city of Pátzcuaro, but that mats of rhizomes began washing up on the shores near her village in 1978. Most respondents who harvested Schoenoplectus at the time of Typha’s establishment initially tried to eradicate Typha (n = 5), because Typha was reported to reduce Schoenoplectus production (n = 7). Respondents from three villages (n = 5) reported that Schoenoplectus was a relatively scarce and valuable commodity during this time period (probably between 1960 and 1980). These harvesters reported establishing new Schoenoplectus clones to increase supply, by burying rhizome fragments along the lake edge. Typha, on the other hand, had no apparent initial value. According to one man, “we killed Typha because no one would purchase it.” Respondents (n = 2) reported that some harvesters organized and paid groups of workers to eradicate Typha from wetlands near Arocutin, by cutting leaves underwater. Initial eradication was purportedly successful. In total, 14 harvesters from eight villages reported having attempted to eradicate or control Typha. Most of these harvesters attempted to eradicate Typha from their wetlands (n = 9), while others only controlled Typha periodically (n = 4) in order to facilitate access to the lake. To kill Typha, harvesters most commonly cut leaves underwater (n = 8). Harvesters also pulled out Typha roots and rhizomes (n = 3), repeatedly cut Typha above water (n = 1), cut and burned fallen litter (n = 1), or chopped rhizomes with a machete (n = 1). One man reported that animal fat was an effective “poison” when applied to cut ramet surfaces with a machete blade. The practice of killing Typha to protect Schoenoplectus declined in some communities as Typha transformed into a valuable resource. Harvesters in Puacuaro and Arocutin (n = 5) reported that Typha control decreased in the 1970s as people began instead to harvest Typha commercially. Meanwhile, the harvest of Schoenoplectus declined. Typha completely replaced Schoenoplectus as a harvestable commodity in Puacuaro (n = 6), while the harvest of Typha outpaced Schoenoplectus harvest in Arocutin (n = 2). Harvesters (n = 6) in both of these communities linked the change in harvesting focus to the arrival of outsiders from Mexico City and/or the United States who taught villagers how to weave Typha into new artesanía products, including animal figurines, office organizers, lampshades, baskets, and pet-houses. Harvesters (n = 4) reported that training sessions spread these new weaving designs to several villages around the lake, creating widespread demand for Typha leaves. Products woven from Typha reportedly received higher prices than the products woven from Schoenoplectus (n = 3), the latter of which included “petates” (mats), “estrellas” (star-shaped decorations), and “sopladores” (fans). The arrival of synthetic mattresses and corrugated metal roofs also apparently decreased demand for Schoenoplectus mats, which were once used for these purposes (n = 2). Some harvesters in Puacuaro (n = 3) viewed Typha as highly beneficial because of the employment it provided. Another harvester, however, cursed Typha for expanding into his maize field, but he said that controlling Typha was extremely labor intensive, so now he harvested and sold as much as he could rather than attempting to control it. Harvesters often reported that Typha increased in abundance relative to Schoenoplectus over time (n = 21), although some harvesters, typically those with less experience, asserted that Typha and Schoenoplectus had maintained similar abundance over time (n = 12). Most respondents attributed Typha’s expansion to superior “strength” (n = 12); others invoked a decline in lake water level (n = 4), sewage discharges (n = 3), a decline in cattle grazing (n = 1), and god (n = 1). Presently, most Typha harvesters reported cutting ramets above the water surface (n = 13), rather than cutting below water as had been done previously to control Typha. Cutting above water was reported to promote regrowth, as opposed to underwater cutting (n = 9). Harvesters also observed that cutting above the water surface avoided the Typha ramet base, which was too thick to be useful for weaving (n = 4). Only the youngest Typha harvesters (n = 3) reported cutting below water; they harvested from large wetlands accessible to the public and reported that Typha was never lacking. No one reported problems related to the sustainability of Typha harvesting, and most respondents harvested the same Typha plants four times per year (n = 10), although some apparently harvested less frequently due to time constraints (n = 5). Respondents universally reported that underwater cutting did not reduce Schoenoplectus regrowth, in contrast to Typha. Those who harvested both species (n = 11) tended to cut Typha above water and Schoenoplectus below water, respectively (n = 10). Respondents, however, never reported harvesting Schoenoplectus more than twice per year. One harvester with more than 30 years of experience would not harvest Schoenoplectus more than once per year for fear of “damaging the rhizome.” Three respondents compared Schoenoplectus to alfalfa, and suggested that although it can support repeated harvest, it is potentially vulnerable to over-harvesting. Responsible harvesting was said to promote regrowth and to improve the quality of leaves for weaving (n = 2): “we take care of Schoenoplectus… by cutting it, it does not dry out.” Harvesting twice a year apparently prevented Schoenoplectus leaves from senescing, a state considered aesthetically unpleasing to some (n = 2). Respondents portrayed highly variable attitudes towards fire. Most (n = 26) reported that their wetlands burned in the dry season from December to March, while only a few (n = 6) denied that their wetlands burned. Harvesters mostly perceived that fire improved subsequent harvesting (n = 20), often citing reduced litter accumulation (n = 11). They variously reported that fire promoted (n = 7), reduced (n = 4), or did not affect (n = 4) Typha regrowth. Two harvesters claimed that they would never burn Typha because this damaged their valuable resource. Others (n = 2) reported that their neighbors burned Typha when it encroached on upland areas, and sometimes succeeded in freeing more land for agriculture. Perhaps most interestingly, two elderly harvesters from different villages collected dried leaves of Typha (n = 1) or Schoenoplectus (n = 1) and burned them in their fields to fertilize the soil as an alternative to chemical fertilizers, which they stated they could not afford. The replacement of Schoenoplectus harvest with Typha harvest that occurred in Puacuaro was not consistent across all villages sampled. Respondents from nine villages harvested both species (n = 13), while respondents from four villages harvested only Typha (n = 10), and respondents from five villages harvested only Schoenoplectus (n = 8). One respondent who continued to harvest Schoenoplectus exclusively claimed that “Typha has no benefits whatsoever.” Some harvesters (n = 4) continued to remove Typha when it invaded their plots of Schoenoplectus, lamenting that their neighbors no longer attempted to control Typha. These respondents explicitly linked a decline in Schoenoplectus abundance to a decline in Typha control, a practice that was traditionally associated with Schoenoplectus harvest. Respondents who harvested Schoenoplectus, however, did not always control Typha. Some who harvested from large, publicly accessible wetlands stated that Schoenoplectus was never scarce despite any increase in Typha abundance (n = 5), possibly because of an overall decline in harvesting (n = 2). In the few instances where I was able to directly observe plots harvested by respondents, I saw dramatic differences in plant composition among plots with different management regimes (Fig. 2). Near Eukasanastacua on the southern shore of Lake Pátzcuaro, some respondents predominantly harvested Typha (n = 3) by cutting above water. In these plots, Typha formed a monoculture at the lake edge, while Schoenoplectus persisted only in deeper water. In neighboring plots, other respondents exclusively harvested Schoenoplectus (n = 2) and actively controlled Typha by underwater cutting or rhizome pulling; Typha was entirely absent from these plots. Where Typha was absent, Sagittaria spp. were frequently present at the wetland/upland ecotone (n = 4 plots), whereas Sagittaria were not present in any plots dominated by Typha in this region (n = 5 plots), or in any other plots that I observed around the lake. Few harvesters reported observing specific plant species that grew with Typha and Schoenoplectus, although half (n = 16) reported the presence of “zacate” (weeds or forage) growing with Typha and Schoenoplectus, and many (n = 12) mentioned “lirio acuático” or “camalote” (Eichhornia crassipes). Some harvesters avoided cutting zacate while they harvested (n = 4), but one harvester reported eliminating zacate with the intention of improving Typha’s growth. No harvesters reported any effects of Typha harvest on other plant species, but two respondents reported that harvesting Schoenoplectus increased the growth of “bayoneta” (Sagittaria spp.) as well as Eichhornia. When asked to speak about other wetland plants, harvesters frequently spoke instead about the decline of Lake Pátzcuaro’s native fish. Several harvesters (n = 4) linked the decline of the plant “putzuri,” (probably Najas guadalupensis), or a decrease of zacate in general (n = 1), to the disappearance of native fish. Some (n = 3) thought that introduced “carpa” (probably Cyprinus sp.) had reduced Najas, and one respondent attributed Najas’s decline to Typha. Farmers apparently controlled access to any wetland vegetation adjacent to their fields, while wetlands adjacent to villages were generally considered public domain where anyone could harvest. Several respondents (n = 5) reported leasing their own wetlands or purchasing harvesting privileges on other wetlands. Some farmers erroneously perceived their territorial rights to extend far into the lake, according to one respondent, although he suggested that small gifts could facilitate access. One landless woman reported paying US $20 four times per year to harvest Schoenoplectus at the edge of a farmer’s field. She reported that Schoenoplectus growing within the lake could be harvested for free, but required a canoe. Not all stakeholders apparently agreed on harvesting rights, however, and two respondents reported being shot at while harvesting in marshes they believed to be publicly owned. In spite of potential restrictions on wetland access, most harvesters (n = 29) never reported a shortage of Schoenoplectus or Typha. Instead, other livelihood activities and seasonal patterns of weather limited the extent of their harvest (n = 11). Rains between May and November made leaf drying more difficult and labor intensive (n = 14). Only three respondents, two elderly men and a young man, dedicated themselves primarily to harvesting. Other respondents pursued numerous livelihood activities in addition to harvesting. Several performed seasonal agricultural work in the United States in addition to planting and harvesting their maize fields. They reported that outside income was necessary in order to support the high cost of the chemical fertilizer now used by many farmers (n = 10). Respondents often stated, unprompted, that the harvest of Typha, and especially of Schoenoplectus, had declined over time (n = 17). Explanations included the migration of many workers to the United States (n = 7), a perception of harvesting as overly strenuous, degrading, or otherwise undesirable work (n = 6), the arrival of vendors who sold Typha and Schoenoplectus harvested from nearby Lake Cuitzeo (n = 2), and a shortage of canoes resulting from deforestation and lack of suitable wood (n = 2). Other respondents (n = 4) reported that other livelihood activities had replaced harvesting. In Jarácuaro, respondents (n = 2) stated that people no longer “took care” of their Schoenoplectus marshes after palm sombrero weaving was introduced. In San Andrés, many former Schoenoplectus weavers reportedly (n = 2) began the more profitable enterprise of weaving ornaments from wheat stubble. Interviews with Lake Pátzcuaro harvesters provided a rich context for understanding non-biophysical factors that apparently influenced Typha’s invasion, and suggested useful themes for understanding invasions more generally. The harvesters’ narrative belied a conception of Pátzcuaro wetlands as a pristine natural community. Rather, harvesters often portrayed their marshes as agricultural systems demanding of care and cultivation and maintained by weeding, burning, and even occasional planting. Many harvesters appeared to substantially affect the initial outcome of a Typha invasion in Lake Pátzcuaro, as hypothesized, by controlling Typha to favor Schoenoplectus, which historically provided the most economic benefit. Harvesters’ predominant control strategy, underwater cutting, has been mechanistically shown to cause anaerobic stress and cell death in Typha (Sale and Wetzel 1983). To implement Typha control, local harvesters sometimes went so far as to hire laborers from outside the community. The actions of many harvesters around Lake Pátzcuaro question the widespread assumptions that rural people lack the techniques, capital, or organization to control invaders (Shackleton et al. 2007), and that the control of invasions requires top–down intervention through environmental bureaucracies (Mack et al. 2000; Robbins 2004). Rather, economic incentives inspired control efforts (Perrings et al. 2002) that may have reduced the short-term proliferation of Typha at the local level. Self-organized local invasive species control efforts, exemplified in this study, could ultimately reduce economic costs of invasive species and their control, costs that grow exponentially as invasions proceed (Lodge et al. 2006). Such voluntary control, however, likely depends on the presence of strong incentives to engage landowners. The commoditization of Typha appeared to accelerate invasion, as some harvesters began to cut Typha above the water surface to encourage regrowth rather than cutting below water as had previously been practiced to control Typha. Changing livelihood strategies and concomitant abandonment of Schoenoplectus harvest also appeared to have accelerated invasion, as harvesters lost incentives to control Typha. In conventional biophysical models of species invasion, a lag between an invader’s establishment and subsequent dominance is often attributed to factors such as natural selection, demographic stochasticity, or chance disturbances (Mack et al. 2000). In the case of Typha in Lake Pátzcuaro, in addition to potentially important biophysical factors such as eutrophication and altered hydroperiods (Boers et al. 2007), foreign economic and cultural information created value for Typha, spurring the abandonment of intensive Schoenoplectus management regimes and contributing to Typha’s competitive release. Analogous to an ecological disturbance, a rapid upheaval of local culture, norms, and economies or “cultural disturbance” appears to have influenced Typha’s invasion: outsiders conceived of a use for Typha in new commercial products, while the arrival of tourists sustained the purchase of these products, and foreign technology obviated the local need for utilitarian objects made from Schoenoplectus. Shackleton et al. (2007) propose several different models for invasion based on the inherent competitiveness and desirability of a given invading species. Building on their work, the example of Typha in Pátzcuaro suggests that spatial and temporal variation in the valuation of a species could be usefully incorporated as an independent variable to predict invasive spread. Here, the desirability of Typha varied across the landscape. Land tenure systems and differential access to wetland vegetation might influence incentives for the remaining Schoenoplectus harvesters to continue to control Typha. Some harvesters saw no continuing need for Typha control because they had access to enough Schoenoplectus to meet their needs, despite Typha’s dominance. In contrast, the harvesters who did continue to control Typha appeared to face a shortage of Schoenoplectus, because they harvested from relatively small wetland parcels adjoining their fields, as opposed to the larger, publicly accessible wetlands that covered tens of hectares. This trend, a negative correlation between access to a commodity and willingness to control an invader, concurs with a pattern of bracken fern (Pteridium aquilinum) control observed by Schneider (2004) in the Yucatán. There, farmers only controlled the invasive when land was scarce; otherwise, farmers abandoned invaded land. Consideration of patterns of land tenure, land use, and changing incentives could improve our understanding of voluntary invasive species control, just as these factors influence the spread of invaders (Perrings et al. 2002). Smallholders, for example, might control invaders more often on their own parcels than on common lands. In addition to providing a social and historical context for understanding invasion, interview data suggested several hypotheses about biophysical cause–effect mechanisms. Harvesters’ most common mechanistic explanations for Typha’s increase, eutrophication and altered hydroperiod, concur with current scientific theory (e.g., Galatowitsch et al. 1999). Increased agricultural fertilizer use and urban sewage provided substantial nutrient loading to Lake Pátzcuaro over the preceding decades (Chacon-Torres and Rosas-Monge 1995). Additionally, harvesters from three separate villages observed that another invasive species, Eichhornia crassipes, facilitated Typha’s initial establishment. If correct, this represents another example of “invasional meltdown,” or positive interactions between invasive species (Simberloff and Von Holle 1999). Other hypotheses generated by harvesters concerned how fire might affect Typha and Schoenoplectus. Most harvesters agreed that most Lake Pátzcuaro wetlands burn frequently, while showing nuanced disagreement about the effects of fire on wetland vegetation, suggesting two hypotheses. When water levels are low, fires that burn the soil could control Typha via rhizome mortality, agreeing with observations that burning Typha in upland areas can make more land available for agriculture. When water levels are higher, fires might remove only above-ground tissue and promote regrowth, consistent with the observation that fire could increase Typha’s vigor. Results from experimental burns of the temperate congener Typha × glauca under varying water depths provide initial support for these hypotheses (Mallik and Wein 1985). Elsewhere, other North American indigenous groups apparently used fire to reduce Typha latifolia and promote Schoenoplectus acutus (Fowler 2000). Understanding the effects of fire on dynamics between Typha and Schoenoplectus requires further experimentation, which could be framed in terms of the hypotheses suggested by harvesters. Harvesters’ observations suggest other novel hypotheses for developing restoration and management strategies. One harvester’s strategy of covering cut Typha ramet surfaces with animal fat should inhibit oxygen diffusion to rhizomes even when ramets are not flooded, providing an alternative control method in shallow water. Harvesters suggested the plausible hypothesis that native fish suffered from declines in submersed aquatic vegetation, mediated by herbivory from introduced Cyprinus or by Typha’s dominance. Populations of native fish that feed and spawn along Lake Pátzcuaro’s shoreline have plummeted since the 1980s, but investigators have not considered potential effects of co-occurring changes in wetland plant communities (Chacon-Torres and Rosas-Monge 1995; Berlanga-Robles et al. 2002). Eutrophication also threatens Pátzcuaro’s fish, and harvesters’ uncommon practice of burning Typha and Schoenoplectus to fertilize fields suggests a strategy for reducing nutrient loading from inorganic fertilizer. With respect to plant conservation, harvesters’ observations and correlative survey data suggest that harvesting Schoenoplectus and controlling Typha could promote the persistence of Sagittaria spp. While Sagittaria macrophylla was reported in Lake Pátzcuaro (Lot and Novelo 1988), it is endangered throughout the Mexican altiplano (Zepeda 1999) and its conservation could require active management, such as the harvest of competing vegetation. In sum, these interview data clearly “add value” to a western scientific approach (Chalmers and Fabricius 2007) and motivate further experimentation. Documenting the breadth of actual harvesting strategies through interviews facilitates the evaluation of harvesting as a biodiversity conservation strategy. A controlled experiment in a nearby spring-fed wetland (La Mintzita, Morelia, Michoacán) showed that harvesting all above-ground vegetation once and selectively harvesting Typha regrowth one or three more times increased plant species richness and promoted the recruitment of uncommon species (Hall et al. 2008). The applicability of that finding, however, depends on the degree to which treatments approximate local management (Ticktin 2004). Data presented here suggest that the experimental harvesting treatments (up to 4 harvests/summer) fall well within the norms of what harvesters can actually accomplish. The interview data also add caveats to the experimental study. While some respondents avoided other plants as they harvested, one Typha harvester consciously weeded other species from his plots. Therefore, the practice of “harvesting” does not necessarily conserve plant diversity, as shown in English wetlands managed for commercial reed production (Wheeler and Giller 1982). Also, obligations to other livelihood activities and seasonal constraints could reduce the willingness of harvesters to participate in conservation management. The implementation of harvesting in protected areas such as La Mintzita would require further dialogue to establish practices that mutually benefit harvesters and conservation (Ticktin 2004). In conclusion, exploring how management practices and incentives affect invasions can provide information that complements biophysical explanations. The case of Typha in Lake Pátzcuaro suggests that changes in incentives can dramatically influence invasions, and that invasive species management could be improved by understanding, and perhaps manipulating, these incentives. Finally, compiling firsthand knowledge from people involved in the invasion process improves the epidemiology of invasions and suggests management solutions. I thank all of the people around Lake Pátzcuaro who participated in interviews, providing camaraderie as well as a cultural education. T. F. H. Allen, D. Bart, J. B. Zedler, and K. Zimmerer provided helpful comments and discussion, and R. Lindig-Cisneros at the UNAM-CIEco in Morelia provided logistical support. The Nelson Institute and the UW-Madison Graduate School provided financial support.